Last year a friend taught us how to make kimchi for the first time. The haksai (Chinese cabbage) was finishing up in the farmer's field, and as usual we were pressed for time. We spent a late night chopping cabbage, carrots, komatsuna, and daikon only to massage them by hand with salt, garlic, ginger, and crushed red peppers until the skin on our arms tingled. 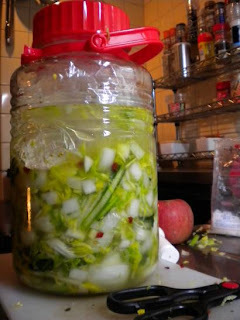 Then it fermented (and overflowed a bit, hence the time in the bathtub) for about a week before our munching commenced. Seeing haksai available again at a nearby vegetable stand, I decided to give it a go on my own this year. There's plenty of komatsuna rolling in these days, along with carrots, daikon, and other assorted vegetables that usually end up in our salad. Inspired as well by the large amounts of fresh ginger available at stalls and farmer's markets of late as well as my own balcony and garden harvest of hot peppers, it seemed like the time was ripe. Hot peppers, a goodly handful depending on your heat tolerance. Chop the cabbage and sprinkle it with a goodly amount of salt. * Massage the salt around on the cabbage to encourage wilting. The salt is drawing fluid out of the cabbage, so the bowl should begin to fill with fluid or brine. Keep adding cabbage and salt* and massaging. When the leaves are fairly soft and a firm press puts them under about a half inch to an inch of brine let them rest while working on the rest. Mix the daikon, carrots, and komatsuna together with salt and start the same wilting and massaging process. Meanwhile, mince the garlic, grate the ginger, and chop the peppers all into the same bowl. Throw everything in with the cabbage and start mixing and massaging again for a good 20 minutes. This ensures solid mixing of all the ingredients, and encourages further brining. Press the mixture down firmly until a couple inches of brine stand above it. The kimchi needs to stay below the brine, so I used the old plastic-bag-with-water-inside technique from the umeboshi days. It creates a firm seal all the way around, but still lets any fluid that needs to sneak up above it. Loosely cap and set in the bathtub for at least five days. I love spicy food, and will say that I used a boatload of my hot peppers. Japanese peppers - togarashi - aren't super spicy, so I went ahead and used a bundle of them. I do wish I'd taken the time to crush them, though, for better mixing. I do wish I'd used more komatsuna. I'd like it to have a little more green mixed in, but I think it's going to be fine. My advice would be to not chop it too fine as kimchi always has big chunks of things sort of straggling off chopsticks as you eat it. I think other greens - spinach, kale, pak choi, whatever - would be good to try as well. I also think the yacon might be a fun addition, too. I didn't have any carrots in the drawer, but I be the purple ones would have been cool. Maybe next time sliced in narrow one inch long strips. *This caveat gets a star because salt can be dangerous. Not just for bloodpressure and bloating, but because too much can ruin the taste. Start with some and remember more can always get added later if necessary. 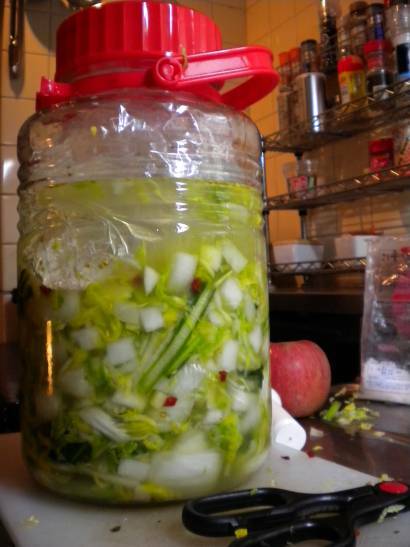 The trick here is to use enough to start the wilting process, encourage fermentation, and preserve the kimchi without overwhelming the flavor of everything else with salt. My solution is to keep sampling as I go to monitor the taste, and take notes of what I do. I don't measure the salt, which I would actually recommend, too.